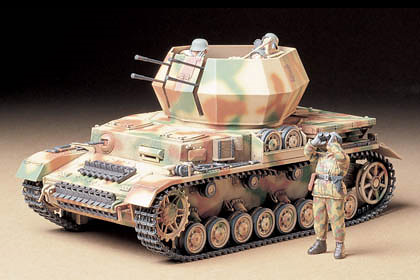 This is the Tamiya 35 233-3000 kit in 1/35 scale, of the ‘German Flakpanzer IV Wirbelwind’. The Flakpanzer IV “Wirbelwind” (Whirlwind in English) was a self-propelled anti-aircraft gun based on the Panzer IV tank. It was developed in 1944 as a successor to the earlier self-propelled anti-aircraft gun Möbelwagen. The Panzer IV’s turret was removed and replaced with an open-top, nine-sided turret that housed a quadruple 2 cm Flakvierling 38 L/112.5. A closed-top design would have been preferable, but this was not possible due to the heavy smoke generated by the four anti-aircraft guns. The shape of the turret earned it the nickname Keksdose (“Biscuit Tin”). The combination of armor and rapid fire from the four guns of the Wirbelwind made it very effective against lightly armoured ground targets such as trucks and armored cars; infantry were particularly vulnerable. This entry was posted in Kits, Stash and tagged 1/35, anti aircraft, flakpanzer, german, panzer iv, pz.kpfw.iv, tamiya, wirbelwind by Thomas. Bookmark the permalink.